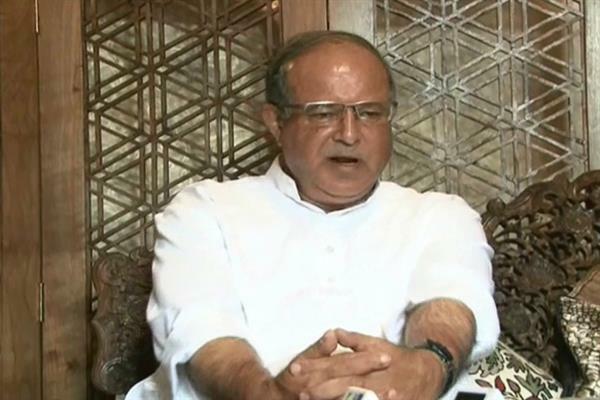 Srinagar, Aug 15 (KNS): Stating that the Bharatiya Janata Party (BJP) was planning to harm the Peoples Democratic Party (PDP) from the beginning, former Member of Parliament (MP) and senior congress leader, Tariq Hameed Karra on Wednesday said that formation of any government in Jammu and Kashmir will be against the aspirations of people. Talking to Kashmir News Service (KNS), Karra said that the BJP was planning to harm PDP from the beginning as the attempts were being made by its leaders since long, saying that today’s revolt in the regional party (PDP) is internal as well as the external. “Even I was also approached by the BJP leaders to form the new dispensation in Jammu and Kashmir after the Late Mufti Muhammad Sayeed felt ill,” he said. He accused PDP of becoming felicitators of BJP for opening up its branches in the Valley. “The BJP-RSS have now entered in every single part of the Valley even in our bedrooms and for that, PDP become their felicitators,” he said. “I was cautioning PDP president, Mehbooba Mufti regarding the plans of BJP but she refused at the time. I believe the situation at present could have been completely different in case today’s dissident PDP leaders had raised their voices,” he said, adding that the party could have taken any step in case these dissidents had uttered something. The former MP said that the situation for the future generation could be more dangerous. He further said that it is not for the first time that revolt against the PDP has taken place but it happened in the past as well when the Late Mufti Muhammad Sayeed felt ill in 2015. “The revolt in the party was going on for at least six months in 2016 during which BJP leaders approached me regarding the formation of the government. The PDP at that time was occupied by the political toddlers and paratroopers,” he said. Karra further stated that he resigned from the post on various reasons including atrocities on people and other things. “Today nobody is going to resign from the post for the people to create an example,” he said.